Rabbit anti Human, Mouse, Rat MIF. Sequence is different from the related rat and mouse sequence by single amino acid. Western blot: At 1-2μg/ml with the appropriate system to detect MIF in cells and tissues. 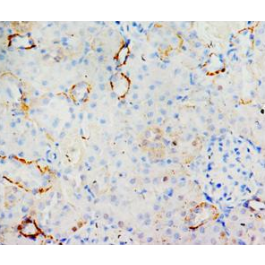 Immunohistochemistry on paraffin sections: At 1-2μg/ml to detect MIF in formalin fixed and paraffin embedded tissues. Macrophage migration inhibitory factor, MIF, is a cytokine released by T-lymphocytes, macrophages,and the pituitary gland that serves to integrate peripheral and central inflammatory responses. MIF gene has 3 exons separated by introns of only 189 and 95 bp, and covers less than 1 kb. Localization of the human gene for macrophage migration inhibitory factor (MIF) to chromosome 22q11.2 MIF plays a critical role in inflammatory diseases and atherogenesis. Store at 2 - 8 °C for up to one month or (in aliquots) at -20 °C for longer. Avoid repeated freezing and thawing. 0.2ml of distilled water will yield a concentration of 500μg/ml. 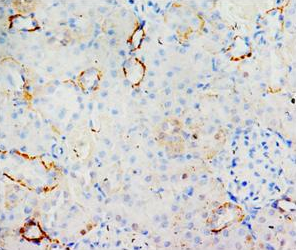 This antibody detects MIF at C-term. No cross reactivity with other proteins.